Mrs. Dagmar Devick passed peacefully in her sleep at her own home on Devick’s Ranch on April 26, 2016, aged 96. She is lovingly remembered and missed by daughter Marina (James), and sons Arthur (Terri) and Paul (Susan), 9 grandchildren: Anita, Bart, Alex (Sandra), Ian, Ned, Steven (Theresa), Cyril, David (Lyndsay), and Michael, as well as many friends and relatives. She has 4 great grandchildren Hanna, Adelle, Jax, Payton, and a new great grandson is expected in June. Dagmar is predeceased by her loving husband, Frank, and sister, Marina. Dagmar was born on July 1, 1919, very soon after her parents had fled from Latvia to Germany. For 6 years Dagmar was brought up on a country estate in Germany while her parents were getting established in Canada. In 1931, at the age of 11, she travelled alone by boat, and then rail, across Canada to Winnipeg, Manitoba to be reunited with her parents and sister, Marina. After learning English for 1 year she finished her schooling, pursued a business course, and then worked for medical doctors and a newspaper. 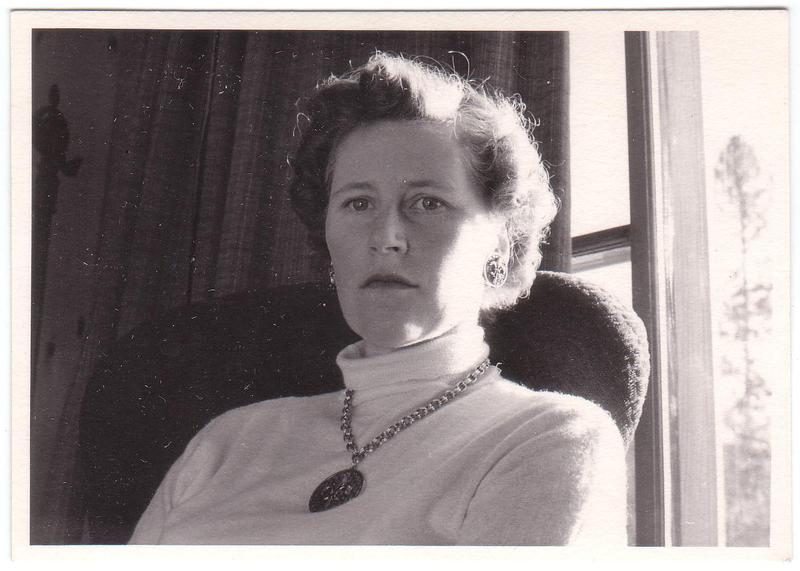 In 1947 she studied electrolysis and then travelled to Vancouver where she opened her own electrolysis practice. In Vancouver she met an elderly gentleman named Harry Devick (Frank’s father), from a remote ranch in the BC interior near Kamloops. 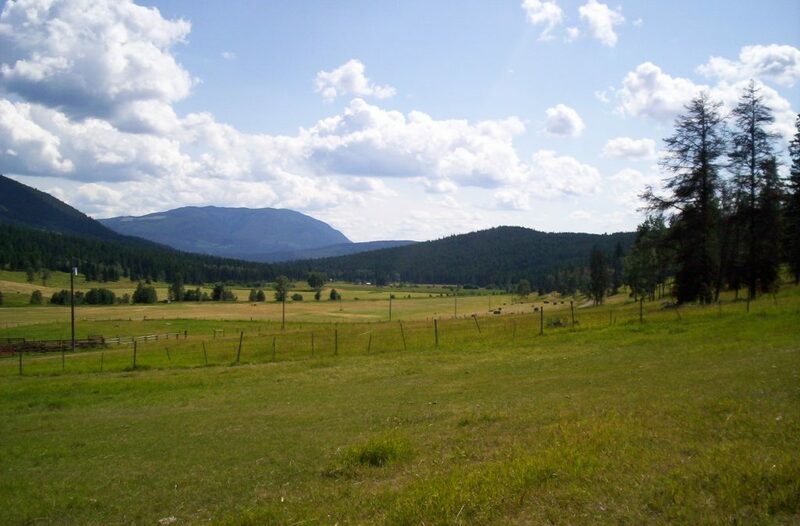 He invited Dagmar to visit the ranch and to meet his son, Frank. 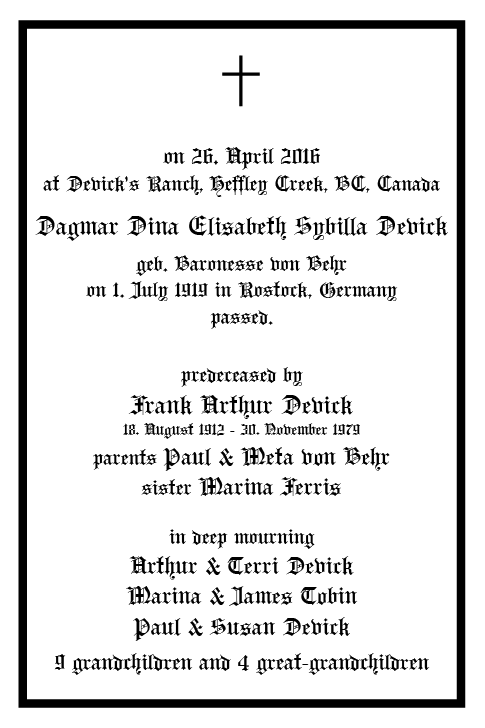 In 1951 Dagmar married Frank Arthur Devick. They lived 28 happy years together. Sadly, Frank passed away in 1979 after a hip replacement operation. Dagmar accomplished many feats in her life: she created a new game, IMO, which she patented and sold. She wrote and published two books – the first the story of Devick’s Ranch, A Dream Come True, and more recently a book about her own life, One Step at A Time. Dagmar was very active in many organizations in the community. She was a charter member of the PEO Chapter AU sisterhood and was also a member of the Anglican Church Cursillo Movement since 1983. She was a longtime volunteer of the Kamloops Hospice Association since its beginning in Kamloops. She was active in PTA at Heffley Creek School when her children attended the school. Dagmar loved playing games, especially Bridge, with so many friends. She valued the strong friendships she held with so many people, many now gone. She loved reading, music, dancing, travelling, collections, gardening, knitting and crocheting and always supported her children’s and grandchildren’s activities. Preserving the pioneer spirit was important to Dagmar. She often hosted parties at the ranch with elders who had fond memories of the ranch in earlier days. She loved nature. Dagmar always had a keen interest in the ranch and gave support in all the ranch activities. And saved you from much pain. It’s sweet to breathe your name. We will meet you again.